Home > Departments > Faculty > Christopher P. Landee Ph.D. Professor Landee received his A.B. from Kalamazoo College and his Ph.D. from the University of Michigan. 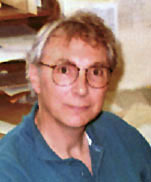 He spent four years at Washington State University and one year at the CNRS laboratories in Grenoble, France before coming to Clark in 1980. He fell in love with France during his stay in Grenoble and has spent two sabbaticals at universities in the Paris region. Professor Landee is an experimental condensed matter physicist with a knack for the chemical synthesis of new magnetic compounds. His current primary interest is the investigation of quantum behavior in low-dimensional antiferromagnets (spin chains, spin ladders, magnetic rectangles and squares). Related interests involve the creation of insulating magnets with spontaneous moments at room temperature, and magets which are unable to order for geometrical reasons. He leads an active group of physics and chemistry students with Professor Mark Turnbull of the Department of Chemistry. Landee uses bulk magnetic measurements (susceptibility and magnetization) spin resonance, and neutron scattering at low temperatures to gain insight into the behavior of the compounds created. Professor Landee finds it "a delight that we can imagine a new magnetic compound, design it using ideas from structural chemistry, grow a crystal in the chemistry lab, and then find that the magnet behaves as we expected." "S=1/2 Quantum Heisenberg Antiferromagnetic Ladders" J. Giantsidis, M. M. Turnbull, C. Galeriu, C. P. Landee, and F. M. Woodward, Submitted to Synthetic Metals, 5 July 2000. "Low-Temperature Heat Capacities and Magnetic Phase Transition of the S = 1/2 Two Dimensional Heisenberg Antiferromagnet, Bis(2-amino-5-chloropyridinium) Tetrabromocuprate(II), (5CAP)2CuBr4", T. Matsumoto, Y. Miyazaki, A. S. Albrecht, C. P. Landee, M. M. Turnbull, and M. Sorai, Accepted for publication, J. Phys. Chem. B. "High-Field Magnetization Studies of Two-Dimensional Copper Antiferromagnets" M. M. Turnbull, A. S. Albrecht, G. B. Jameson, and C. P. Landee, Mol. Cryst. Liq. Cryst. 335, 245-252 (1999). "Pyrazine-Bridged Copper Linear Charins: Molecular-Based One-Dimensional Quantum Antiferromagnets", C. P. Landee and M. M. Turnbull, Mol. Cryst. Liq. Cryst. 335, 193-200 (1999). "Characterization of a quasi-one-dimensional spin-1/2 magnet which is gapless and paramagnetic for gmBH << J and kBT << J", P. R. Hammar, M. B. Stone, D. H. Reich, C. Broholm, P. J. Gibson, M. M. Turnbull, C. P. Landee and M. Oshikawa, Phys. Rev. B 59, 1008-1015 (1999).